The post Daily Style Diaries: Off To Europe! appeared first on Hello Fashion. Become a Nordstrom Member ASAP! When in doubt, pull the trigger. The post 3 Ways To Prepare for the Nordstrom Anniversary Sale appeared first on Hello Fashion. 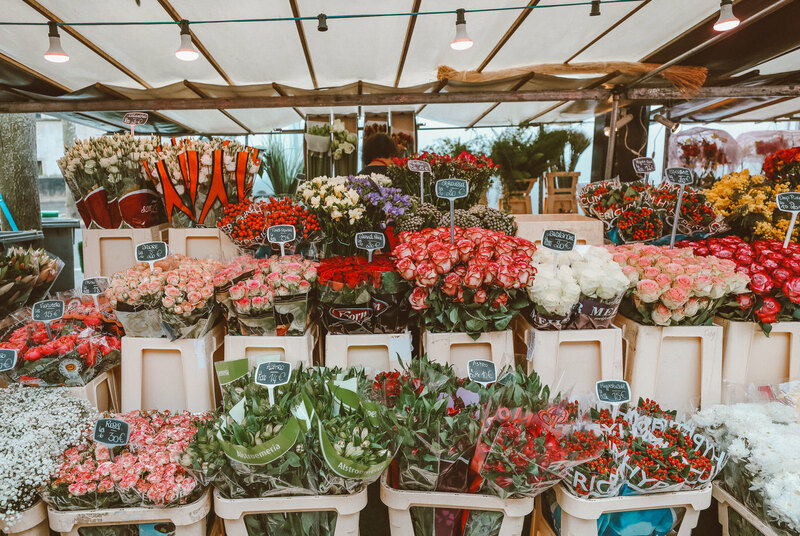 The Flower Market: This was my favorite part of the trip!! 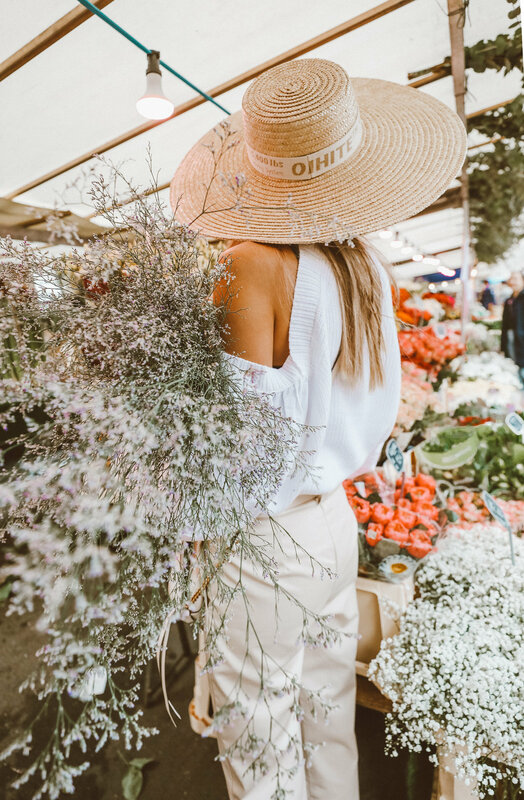 It was my first time to a French flower market and it was every bit as amazing as it sounds. There were no other tourists so it felt like a typical Parisian Saturday morning, picking up produce and flowers for the week. I almost cried because I was literally just so happy! I made a little Vlog of our trip below. Also these pictures were edited with my Lightroom presets you can buy them here . The post Paris Girls Trip! appeared first on Hello Fashion. Hey guys! I may or may not have a slight shoe obsession, so of course I had to round up some of my current favorite pairs for spring and summer! I’ve broken down some of my favorites in each category! I’m all over the woven shoe trend and love the look and fit of these block ankle boots and also love these cute pom pom espadrilles (Under $100). Tennis shoes are something I wear almost every single day, whether it’s a pair that I can wear from the gym to running errands like these, or more fashion forward statement shoes that are easier to dress up, (so so obsessed with this pair!). I love cute feminine heels hence why I’m loving slingback kitten heels lately – how cute are these?! The post Spring and Summer Shoe Guide appeared first on Hello Fashion. The post The Ultimate Mother’s Day Gift Guide appeared first on Hello Fashion. The post Camel & Red appeared first on Hello Fashion. The post You Don’t Want To Miss This Sweater (And It’s Under $100) appeared first on Hello Fashion. Happy Monday! Cody and I went to Miami for a day and a half for a fun event with Shopstyle. It’s always fun when we have a second to ourselves (I always really miss the kids but loved having this one on one time with Cody). It was a super short trip but so fun! Shopstyle put on this really cute brunch the morning before the game and I wore this pretty gingham top. Between the ruffle detail, the one shoulder silhouette, and the gingham print it’s like a match made in heaven. It comes in 3 colors and is under $100! These shorts are super versatile too – I wore them to the game at night too. You can cuff them up or wear then down (on sale under $75). I always love getting to go on trips when I can see some of my blogger friends and also get to meet new girls! Everyone brought their S/O’s so it felt like a mini couple’s retreat. After the brunch we had a few minutes to swim and the water was the warmest I’ve ever felt it – it seriously felt like a bathtub! It was so fun having an instant group of friends to see the game with too. I can’t believe this was my first soccer game! My mom and Cody are both huge soccer fans so it was exciting to go to the game. Wes’ favorite team is Real Madrid and Messi is his favorite player so that made it even better! They also made us personalized jerseys which were so cute. The energy at the game was insane! It was a higher energy than any other professional sports game that I’ve ever been to. People actually got upset if you stood up and were blocking their view haha so you have to wait until true halftime when there’s no action to be able to stand up and get a good pic. We are back home for a quick second filming a secret project so follow on Insta stories for some sneak peeks! The post Daily Style Diary: Miami Weekend appeared first on Hello Fashion. Hey guys! Cody and I are heading up to Sun Valley with this family this weekend – can’t wait for some family time together! It’s always a lot cooler up there so I’m excited to pack a few layer I’ve gotten recently. I found this sweater on sale for under $50 and got it in both oatmeal and charcoal. I love cozy layers and wear them non-stop during the fall so I wanted to share a round-up of a few more great cardigans – all of which are on sale and most are under $100! Obsessed with the tie detail on the sleeve! It makes this one look a lot higher end. Also love the lattice detail on the back of this one – it works great as a sweater or unbuttoned to style as a cardigan. Sweaters are a great way to add some texture to your wardrobe too. I love all the waffle-knits and ribbed knits – how pretty is this one (under $100)? Below are a few more great layers on sale! The post The Layer You Need In Multiple Colors and Styles appeared first on Hello Fashion. Happy Friday!! Today the Nordstrom Anniversary Sale finally opens to the public! Almost everything in this look is on sale for under $100! This is the same cardigan you saw me in yesterday. It’s so soft and comfy, I’m obsessed! Also love these lace camis – they are such a good layer! I’ve worn both of them multiple times already. They are so pretty layered with a strappy or lacy bralette and on sale for under $20! Love the fit of this long sleeve tee (under $20)! It has a wide neck so I love the effortless look of wearing it off the shoulder. I got this one in multiple colors too. I love my comfy sweatshirts! This one has a great graphic detail so it’s a little more interesting that basic solids. These jeans are another good find under $50. Lvoe the wash and the relaxed fit. This windbreaker is another one of my favorite buys from the Nordstrom Anniversary sale. I realize I’ve been on a bit of a red binge lately so I’m not surprised this bright red colorblocking drew me in. Such a good layer with jeans or your favorite joggers. I can’t get enough of bell sleeves right now! Love this one in bright yellow and the back detail makes it seem really high-end. This coat!! You saw it in this last roundup of sale favorites, but it’s so good I had to share again. I love it styled with neutrals and a minimalist pair of suede loafers for a cozy, put together look. You can shop my other Nordstrom Anniversary sale round-ups here and here, all about layers here, and the best of shoes here. And for those of you who have asked, these are some of my beauty picks from the sale! The post Nordstrom Sale Open to the Public! appeared first on Hello Fashion. This floral kimonoÂ (40% Off under $100)! I always get so excited for Nordstrom’s yearly sales and wanted to share some of my finds! I’m a sucker for all things pink! These pretty distressed shorts are a must for this summer and I love this one-shouldered sweatshirt (both under $50). It’s the best of both worlds during this transition between seasons. Also how pretty is this floral kimono! Layers add so much to an outfit, so I love this one that’s so lightweight and perfect for summer. Found: the perfect sun dress! I love the peek-a-boo and tie detail in this oneÂ (under $100) and the scalloped lace hem makes it seem really high end. Stripes never get old! I found this satin striped top on sale and was obsessed – it’s so soft and a great piece you can work into your office wardrobe or knot and wear with your favorite boyfriend shorts this summer. Love love love the ruffle detailing onÂ this sweatshirt! I could live in cozy tees and sweatshirts, so I love finding ones that have a cool detail to make it stand out. And how good is this shade of blush? Ok this topÂ isn’t on sale but it is still a great price point I had to add it :)! I can’t get enough of gingham right now and I love the ruffled sleeves. You can shop more of my sale favorites below! And hope those of you in the US have a fun (and safe!) Memorial Day weekend! Much love! The post Nordstrom Half Yearly Sale Picks appeared first on Hello Fashion. I’ve been on an earring kick lately. I feel like these are the perfect pop in an outfit. I love the coral contrast paired with this olive blazer. Obsessed with these shoes under $50! My friend Whitney had a similar pair from Zara that was sold out so I was so excited when I found these under $50! Happy Monday guys! How was your weekend? I was feeling kind of uninspired last month with clothes and then this month I feel like there are so many great buys and cute pieces! These jeansÂ are one of my favorite recent buys – you saw them on this post and I pretty much lived in them this weekend. They are under $100 and the fit and wash seem so much more expensive – love!! I had also beenÂ wanting some black slides, and when I saw theseÂ I put them on immediately in-store and wouldn’t take them off haha. They are definitely a new favoriteÂ under $50! This olive linen blazer is another great find under $100 and a great lightweight layer for the office or just a typical day. The post Daily Style Diary: May 18th 2017 appeared first on Hello Fashion. Hey guys, so I am starting a new series called Daily Style Diary. Each day I will post the outfit from the day before I wore on my Instagram (@hellofashionblog) so you have quick, easy links to shop my outfits. The dates will be in the titles so if you see an old Instagram post you can search for the date on my blog and easily find the exact outfit and get details. Some days you will see multiple blog posts: my Daily Style Diary and other new content for the day. So be sure to check for both posts so you don’t miss anything. Polka dots are one of this season’s unexpected prints. A part of me felt like this print was semi-childish, but when I saw this cute mini skirt (under $60) I loved that the ruffle detail made it feel a little more sophisticated yet still playful. Also for everyone asking about my pink lace top from my Viktor Rolf post with Beckam, the brand isÂ Self Portrait but it’s from last Spring and no longer available :(. But it’s definitely a stunner! This one is super similar. The post Daily Style Diary: May 11th, 2017 appeared first on Hello Fashion.